Validated VR platform gives new techniques to surgeons and staff to increase confidence in procedures. Big medical mergers and funding in healthcare spotlight the week of robotics transactions in recent weeks. BIONIK, Ekso Bionics, and Corindus Vascular Robotics enter new markets for robotics solutions. Surgical robotics moves beyond hardware to give a surgeon better skills and improve patient outcomes. While it may be some time before robot swarms can eradicate tumors or eliminate the need for certain procedures, researchers are finding promising uses for smarter swarms. Surgical robots are evolving, with newer systems incorporating tele-operation, virtual reality training, and more procedures. Here are five to watch. 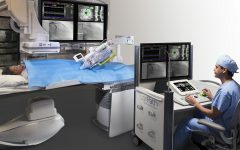 The high-tech surgical training facility is the first in the U.S. to partner with the British robotics company to train surgeons with the Versius next-generation robotic system. Logistics robotics, surgical robots and autonomous vehicle developers all score big in a post-Thanksgiving funding spree.